warriors could outlast any enemy. In August 1227, a somber funeral procession—escorted the body of perhaps the most renowned conqueror in world history-made its way toward the Burkhan Khaldun (Buddha Cliff) in northeastern Mongolia. 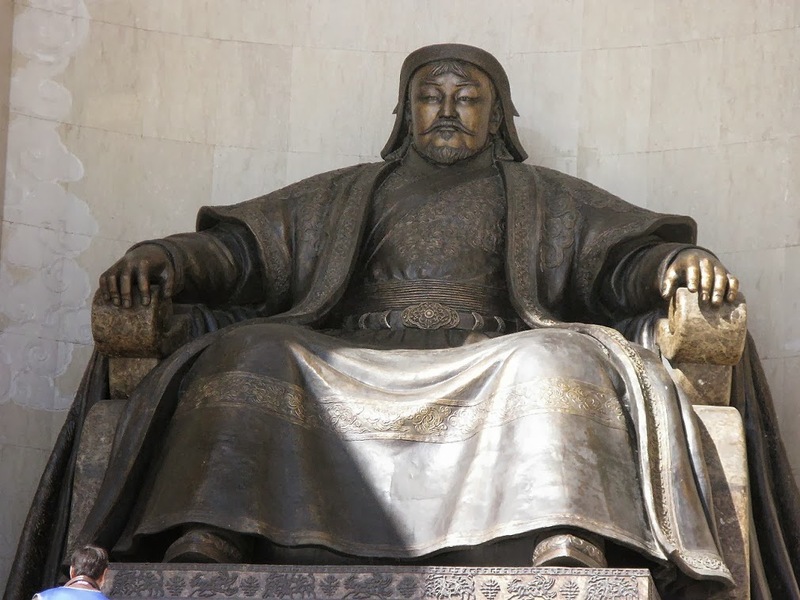 Commanding a military force that never amounted to more than 200,000 troops, this Mongol ruler had united the disparate, nomadic Mongol tribes and initiated the conquest of territory stretching from Korea to Hungary and from Russia to modern Vietnam and Syria. 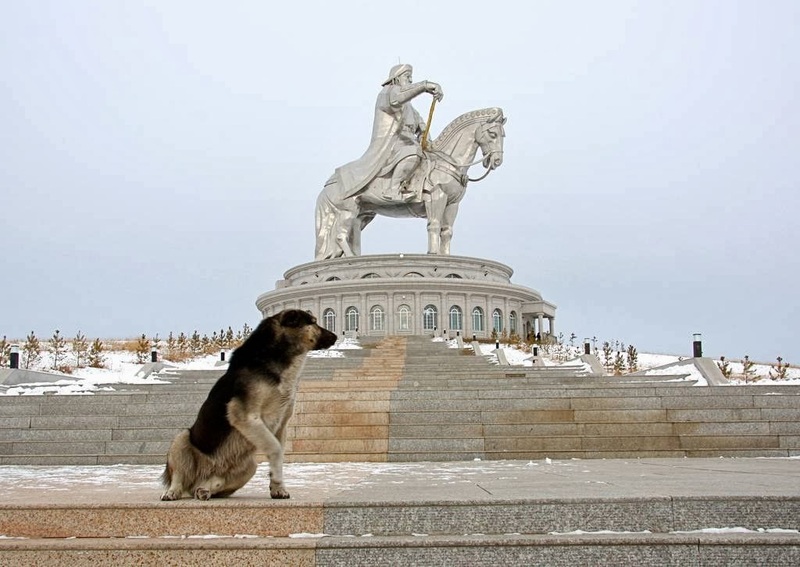 Genghis Khan and his descendants could not have conquered and ruled the largest land empire in world history without their diminutive but extremely hardy steeds. 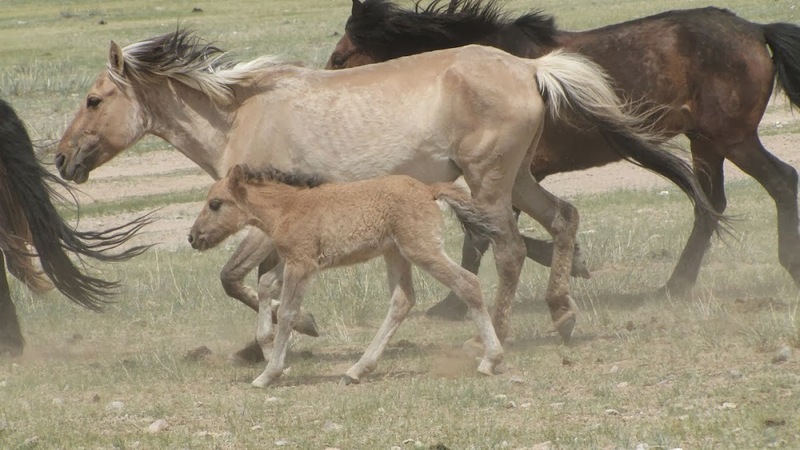 In some respects, these Mongolian ponies resembled what is now known as Przewalski’s horse. Mongols held these horses in highest regard and accorded them great spiritual significance. Before setting forth on military expeditions, for example, commanders would scatter mare’s milk on the earth to insure victory. 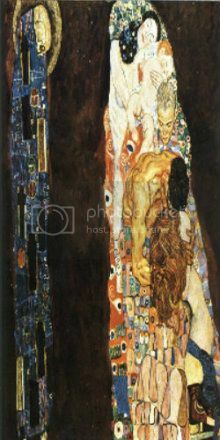 In shamanic rituals, horses were sacrificed to provide “transport” to heaven. 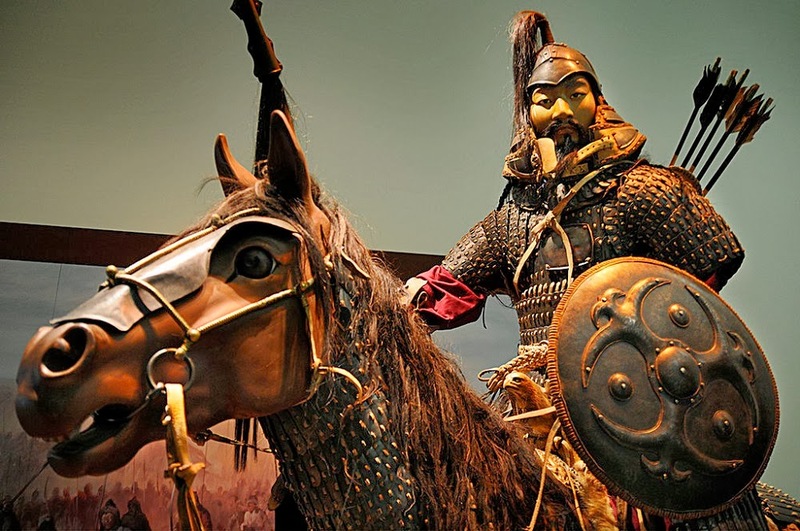 The Mongols prized their horses primarily for the advantages they offered in warfare. 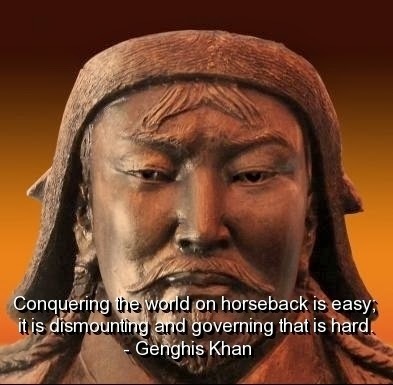 In combat, the horses were fast and flexible, and Genghis Khan was the first leader to capitalize fully on these strengths. After hit-and-run raids, for example, his horsemen could race back and quickly disappear into their native steppes. Enemy armies from the sedentary agricultural societies to the south frequently had to abandon their pursuit because they were not accustomed to long rides on horseback and thus could not move as quickly. Nor could these farmer-soldiers leave their fields for extended periods to chase after the Mongols. 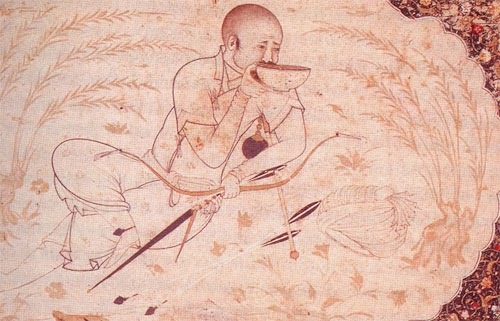 The Mongols had developed a composite bow made out of sinew and horn and were skilled at shooting it while riding, which gave them the upper hand against ordinary foot soldiers. With a range of more than 350 yards, the bow was superior to the contemporaneous English longbow, whose range was only 250 yards. A wood-and-leather saddle, which was rubbed with sheep’s fat to prevent cracking and shrinkage, allowed the horses to bear the weight of their riders for long periods and also permitted the riders to retain a firm seat. Their saddlebags contained cooking pots, dried meat, yogurt, water bottles, and other essentials for lengthy expeditions. Finally, a sturdy stirrup enabled horsemen to be steadier and thus more accurate in shooting when mounted. A Chinese chronicler recognized the horse’s value to the Mongols, observing that “by nature they [the Mongols] are good at riding and shooting. 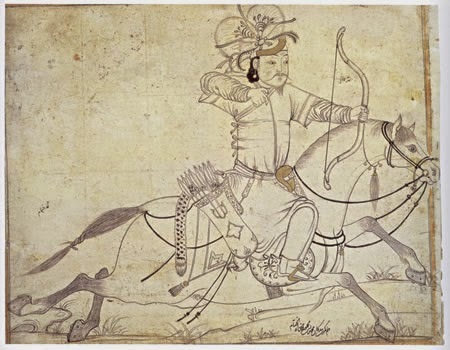 Genghis Khan understood the importance of horses and insisted that his troops be solicitous of their steeds. 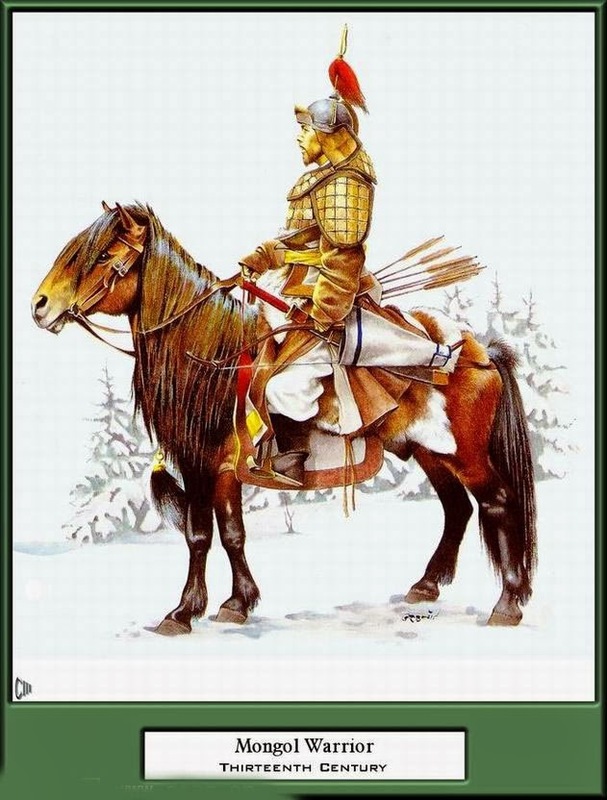 A cavalryman normally had three or four, so that each was, at one time or another, given a respite from bearing the weight of the rider during a lengthy journey. 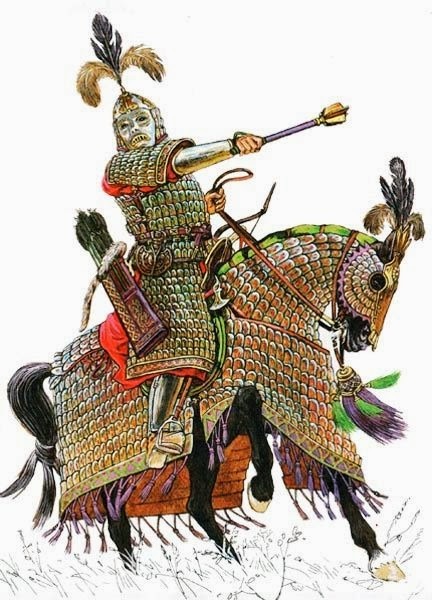 A mongol Elite cavalryman or commander.Magnificently equipped in steel lamellar armour. 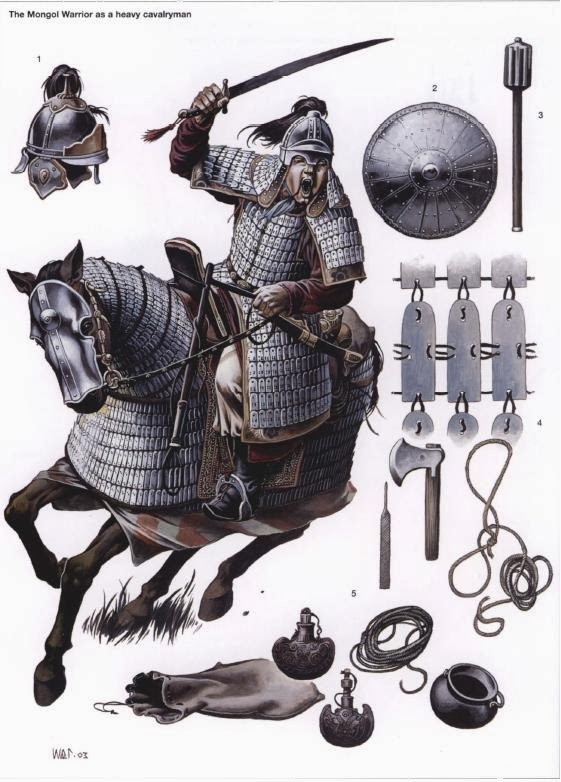 Before combat, leather coverings were placed on the head of each horse and its body was covered with armor. 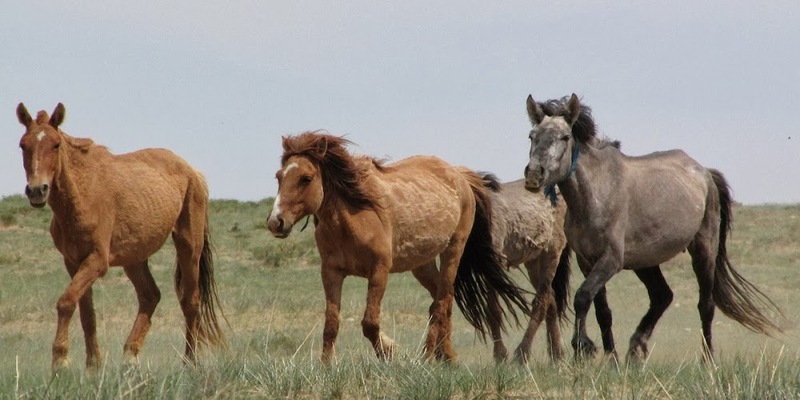 After combat, Mongol horses could traverse the most rugged terrain and survive on little fodder. According to Marco Polo, the horse also provided sustenance to its rider on long trips during which all the food had been consumed. 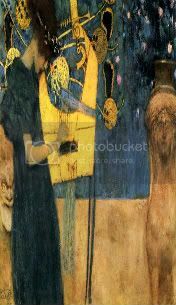 On such occasions, the rider would cut the horse’s veins and drink the blood that spurted forth. 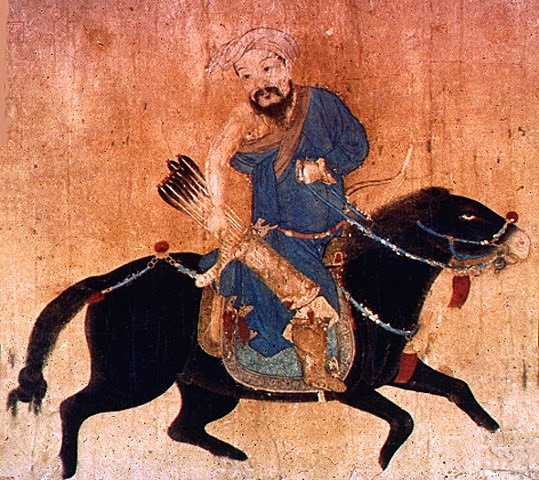 Mobility and surprise characterized the military expeditions led by Genghis Khan and his commanders, and the horse was crucial for such tactics and strategy. Horses could, without exaggeration, be referred to as the intercontinental ballistic missiles of the thirteenth century. 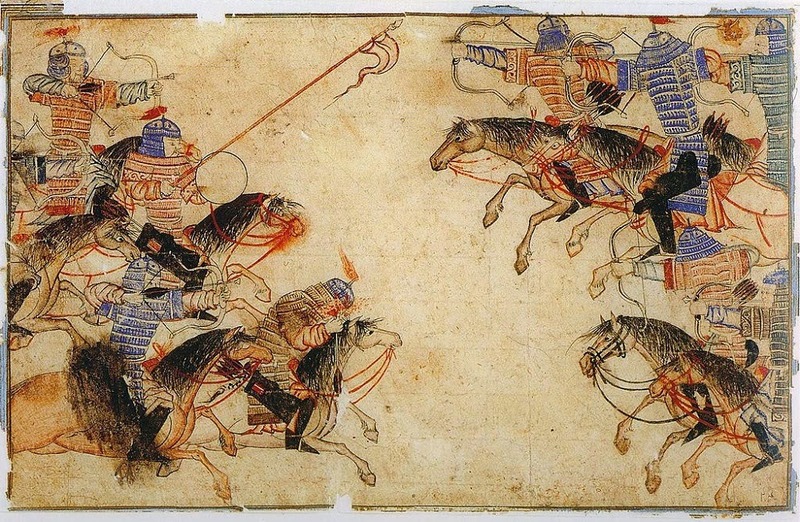 The Mongols at the battle of the Kalka. 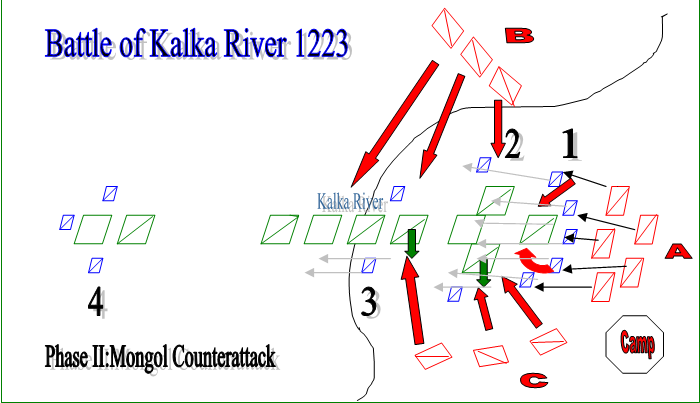 The battle of the Kalka River, now renamed the Kalmyus River, in southern Russia is a good example of the kind of campaign Genghis Khan waged to gain territory and of the key role of horses. After his relatively easy conquest of Central Asia from 1219 to 1220, Genghis Khan had dispatched about 30,000 troops led by Jebe and Subedei, two of his ablest commanders, to conduct an exploratory foray to the west. After several skirmishes in Persia, the advance forces reached southern Russia. In an initial engagement, the Mongols, appearing to retreat, lured a much larger detachment of Georgian cavalry on a chase. When the Mongols sensed that the Georgian horses were exhausted, they headed to where they kept reserve horses, quickly switched to them, and charged at the bedraggled, spread-out Georgians. 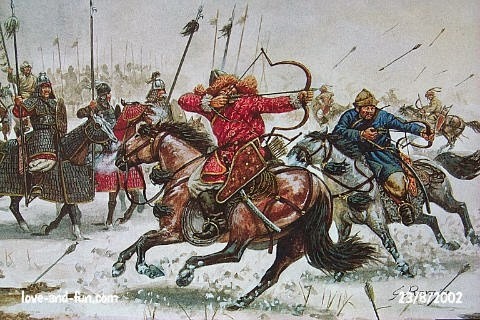 Archers, who had been hiding with the reserve horses, backed up the cavalry—with a barrage of arrows as they routed the Georgians. 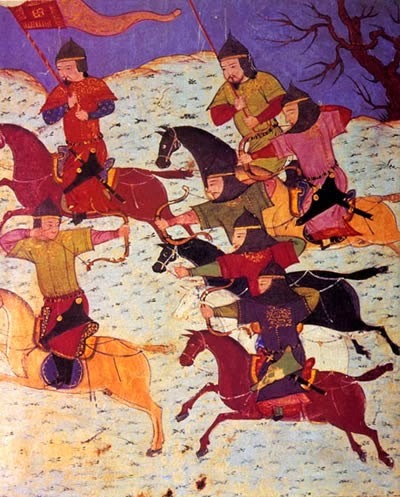 Continuing their exploration, the Mongol detachment crossed the Caucasus Mountains, a daunting expedition during which many men and horses perished. They wound up just north of the Black Sea on the southern Russian steppes, which offered rich pasture lands for their horses. After a brief respite, they first attacked Astrakhan to the east and then raided sites along the Dniester and Dnieper Rivers, inciting Russian retaliation in May of 1223 under Mstislav the Daring, who had a force of 80,000 men. Jebe and Subedei commanded no more than 20,000 troops and were outnumbered by a ratio of four to one. Knowing that an immediate, direct clash could be disastrous, the Mongols again used their tactic of feigned withdrawal. 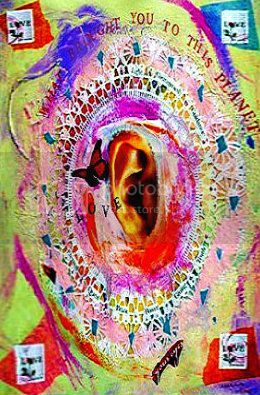 They retreated for more than a week, because they wanted to be certain that the opposing army continued to pursue them but was spaced out over a considerable distance. 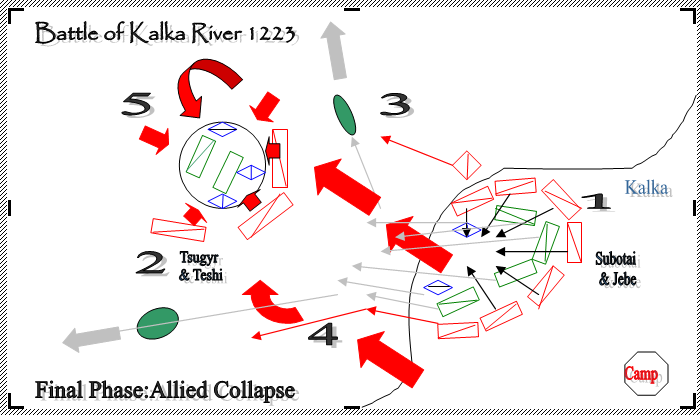 At the Kalka River, the Mongols finally took a stand, swerving around and positioning themselves in battle formation, with archers mounted on horses in the front. 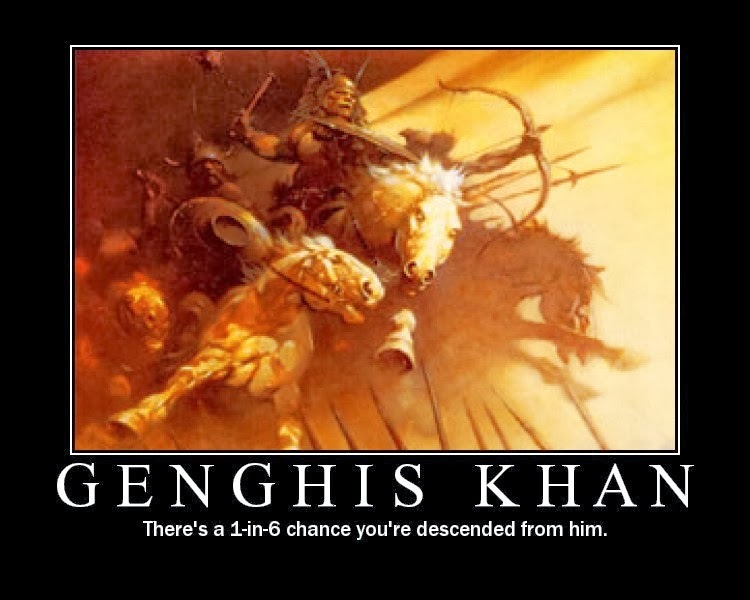 The Mongols’ retreat seems to have lulled the Russians into believing that the invaders from the East were in disarray. Without waiting for the remainder of his army to catch up and without devising a unified attack, Mstislav the Daring ordered the advance troops to charge immediately. This decision proved to be calamitous. 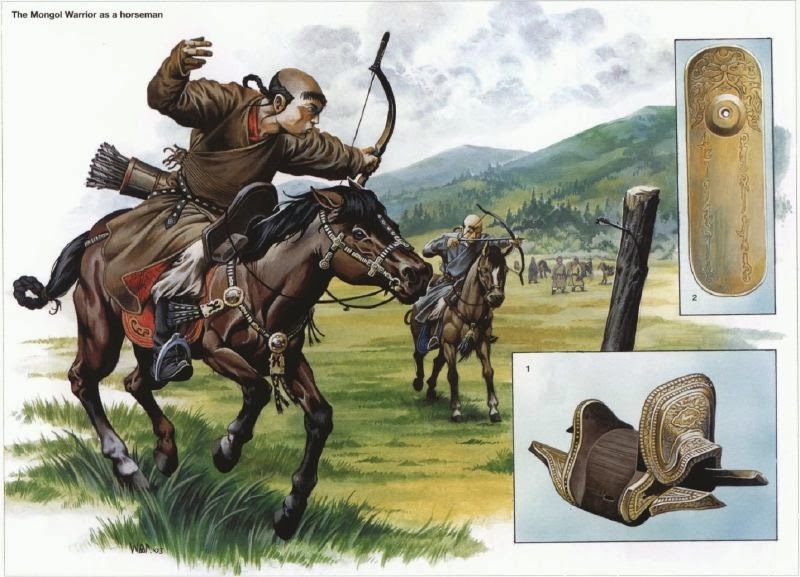 Mongol archers on their welltrained steeds crisscrossed the Russian route of attack, shooting their arrows with great precision. The Russian line of troops was disrupted, and the soldiers scattered. 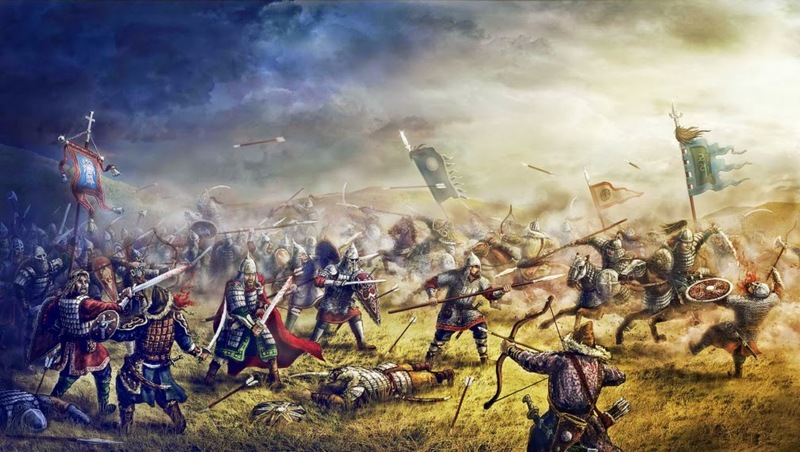 After their attack, the archers turned the battlefield over to the Mongol heavy cavalry, which pummeled the already battered, disunited, and scattered Russians. 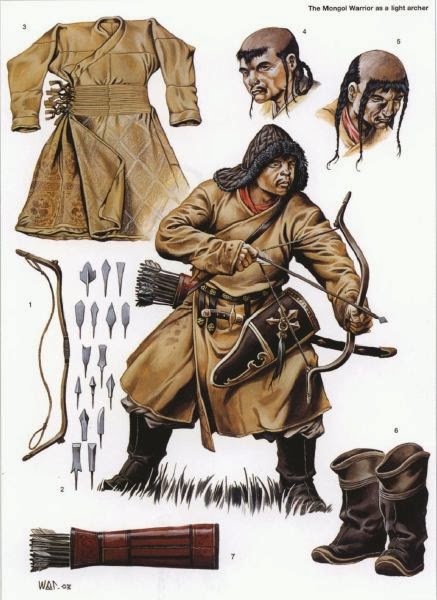 Wearing an iron helmet, a shirt of raw silk, a coat of mail, and a cuirass, each Mongol in the heavy cavalry carried with him two bows, a dagger, a battleax, a twelve-foot lance, and a lasso as his principal weapons. Using lances, the detachment of heavy cavalry rapidly attacked and overwhelmed the Russian vanguard, which had been cut off from the rest of their forces in the very beginning of the battle. Rejoined by the mounted archers, the combined Mongol force mowed down the straggling remnants of the Russian forces. Without an escape route, most were killed, and the rest, including Mstislav the Daring, were captured. Rather than shed the blood of rival princes—one of Genghis Khan’s commands—Jebe and Subedei ordered the unfortunate commander and two other princes stretched out under boards and slowly suffocated as Mongols stood or sat upon the boards during the victory banquet. 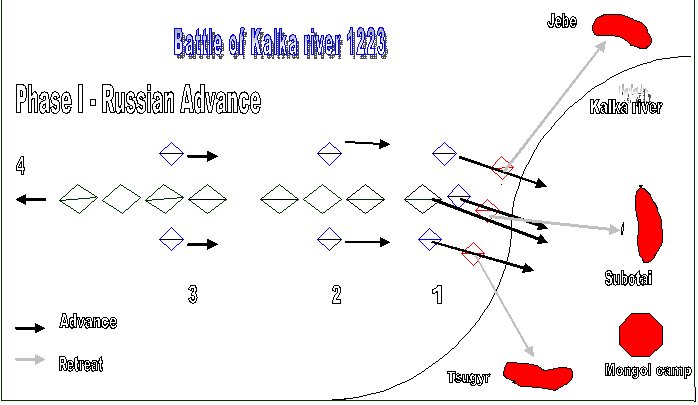 The battle at the Kalka River resembled, with some slight deviations, the general plan of most of Genghis Khan’s campaigns. 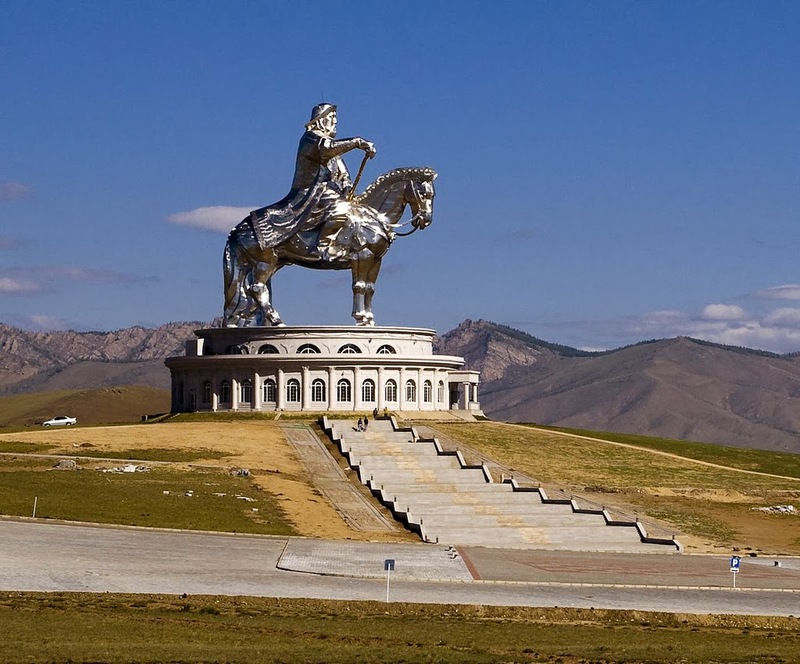 In less than two decades, Genghis Khan had, with the support of powerful cavalry, laid the foundations for an empire that was to control and govern much of Asia in the thirteenth and fourteenth centuries. 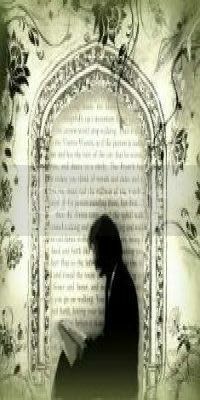 He died on a campaign in Central Asia, and his underlings decided to return his corpse to his native land. Any unfortunate individual who happened to encounter the funeral cortege was immediately killed because the Mongols wished to conceal the precise location of the burial site. At least forty horses were reputedly sacrificed at Genghis Khan’s tomb; his trusted steeds would be as important to him in the afterlife as they had been during his lifetime.